As a Canadian, I am always so proud and inspired when I hear or read about people actually enjoying the tortuous winter conditions the country has to offer. I think it´s great that they can look at Canada´s climate with optimism, even if I can´t. So, if three feet of snow, -30ºC and nature towering over you are what you need this Christmas, then Skoki Lodge, located just outside of Banff, Alberta, might just be the place for you. Built in the 1930´s as a ski-retreat, the lodge has not lost its rustic charm: no electricity, no running water, no internet. Ranked as Canada´s highest lodging in any of its national parks, trying to use one´s cell phone is futile. It is no easy feat to access the Skoki, either. One has to hike or cross-country ski the 11kms of ungroomed trails starting from the Lake Louise ski-hill. Nonetheless, at the end of the trip, you would undoubtedly experience such a sense of accomplishment. As ecotourism increases, I have no doubts in my mind that home-sweet-home is going to become a haven for the courageous traveler. It´s a beautiful country, vast and trying, but you will feel proud to say: ¨I survived a Canadian winter.” Now, there are more options to experience Canadian wilderness than ever before, especially on the Westside. Although I have never been to Banff myself, people keep telling me about its grandiose beauty. It´s on my list of places to visit, but maybe in the summer. So, if you are surrounded by palm trees, sandy beaches and are dreaming of a white Christmas, most of Canada is already covered. Just as an added bonus, I was also told that Santa Claus lives in the North Pole, Canada. Postal Code: HOH OHO. 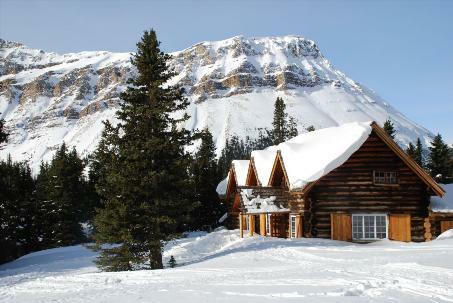 For a full article on Blair Cosgrove´s Christmas experience at the Skoki Lodge.